Healthcare demands will always be a growing concern. Designing an effective and caring healthcare facility is an intricate process; it needs to meet a full range of activities, from routine exams to life threatening emergencies. As healthcare facility managers, our goal is to keep patients safe and in a welcoming environment that enhances quality and patient satisfaction. A healthcare design trend we continue to see requires creating spaces that reflect calmness and strive to ease the patient's journey. 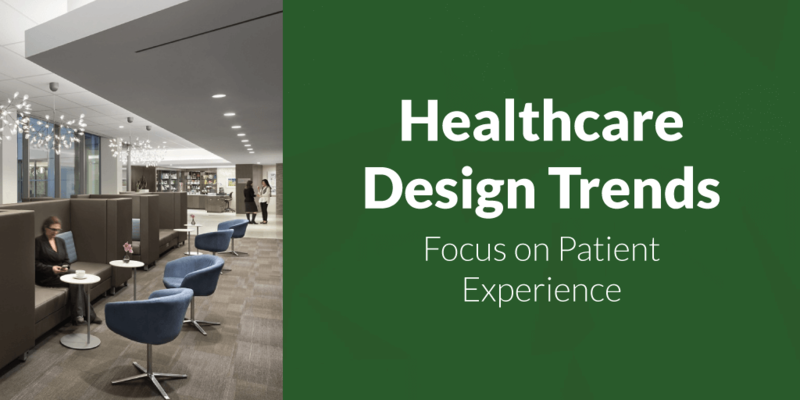 We gathered the top 11 trends that shape healthcare design and the facilities doing it right. Facilities are supporting patient comfort with spaces that make them feel more at home. Artwork, improved color palettes and a use of natural light are ways hospitals are beginning to transition the rooms. More healthcare facilities are incorporating bedside furniture and head walls to favor that "home" feeling. The goal is to make patients feel comfortable and downplay the older, institutional look. To further reduce a patient's anxiety level, healthcare facilities are using pre-arrival patient surveys. The surveys are used to determine a patient's favorite item such as a favorite food that is allowed or reading material. Studies have shown the extra amenities induce more confidence in the level of care patients receive. Customized rooms increase their immediate comfort level. A patient-centered approach like this is invaluable, considering the average length of stay in hospitals in the U.S. is 6 days. There is multipurpose furniture available to help with the space constraints of a hospital room. From recliners to sleeper sofas, both are ways to improve the limited space for visitors and patients. A sleeper sofa and table allows family members to carry on with their daily activities and still stay in the room for support. It ensures sufficient space to accommodate family members. Designs with little visual clutter will help reduce stress for the patient, staff and visitors. Jocelyn Stroupe, director of healthcare interiors at CannonDesign (Chicago), says introducing more color comes with plenty of benefits, — if done properly. “Color can enhance the activity within a space, create a positive distraction, and promote way-finding." Regional influences can play a big part in healthcare design. A facility in the South West may be vastly different than one located in the North East. Local culture shows peace and respect to their patients' lifestyles and perception. In the southwest, centered around the four corners area of Utah, Colorado, Arizona, and New Mexico, the decor would reflect its history and culture. 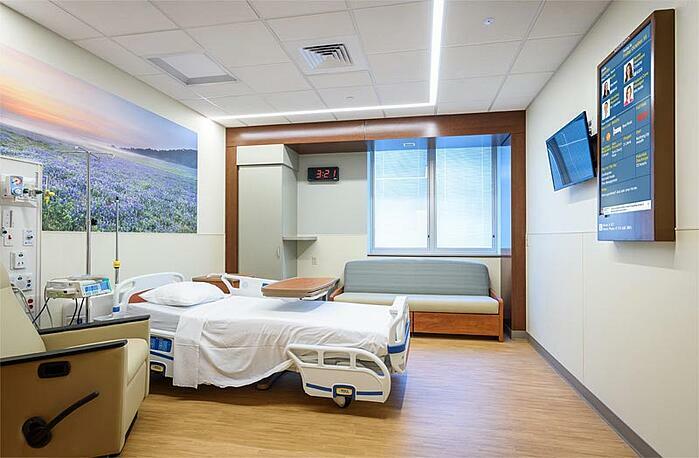 Jennifer Kenson, principal of healthcare interiors at Francis Cauffman (Philadelphia), recommends "indirect or integrated architectural lighting to avoid the harsh effect created by direct downlighting." Creating the right ambiance is calming for both staff and patients. UC Health (Cincinnati) at the University of Cincinnati, is in the process of building "an all-white tensile mesh of polyester fiber wrapping the east, west, and south exterior of the building and providing diffused, calming lighting throughout the building to address patients' light sensitivities." The completion of this project is projected for 2019. 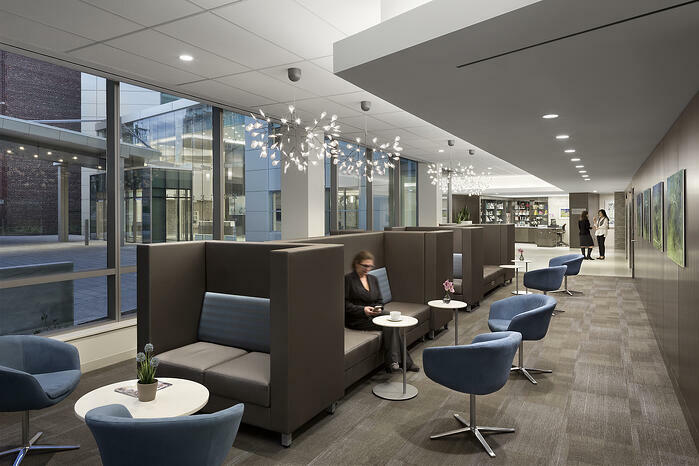 Steelcase, a company that produces furniture, architectural and technology products for office environments, including the healthcare industry, shared one hospital that is experimenting with colored LED lights so patients can add more visual interest to their rooms. In addition, this family member loved the natural light, but also loved the ability to control the room lighting. Murals are becoming a common design that make healthcare facilities unique. Designers are trying to incorporate fun designs to stand out. Hospitals can be very frightening to children, and the use of cheerful artwork can improve their well-being. 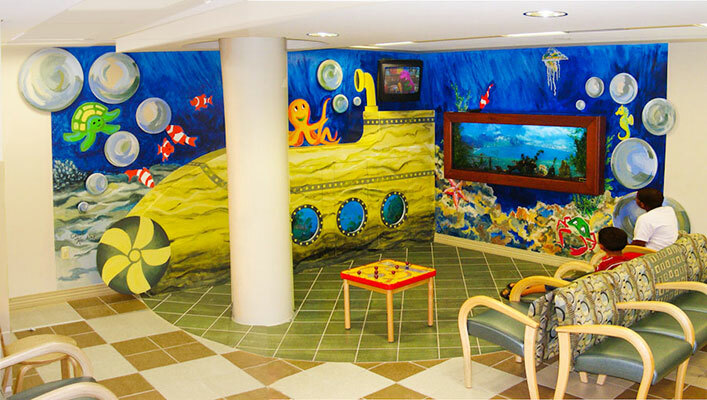 St. David's Hospital in Austin, TX displays a yellow submarine, undersea mural to entertain children in the emergency rooms. Charging a mobile device is always on someone's agenda. Several facilities are finding that adding furniture such as end tables with outlets and USB ports boosts the overall happiness of patients and visitors. Some facilities are also becoming "smarter" with check-in kiosks in the waiting rooms. "Check-in kiosks are popping up in all sorts of healthcare facilities and they are becoming a major part of design because they are one of the first things that patients are supposed to see." Facilities are embracing new ways to think about patient experience. Shifts in design are going from sterile and uninviting to more homey, comfortable designs. These designs use more private spaces where patients and visitors can wait comfortably. Gone are the days of rows and rows of chairs with people sporadically seated. High-backed seating in the lobby at White Plains Hospital Cancer Center in White Plains, NY, designed by Perkins Eastman, delivers visual and acoustical privacy. Research indicates that nature and daylight tend to put patients at ease. And, in some cases, can even make them heal quicker. 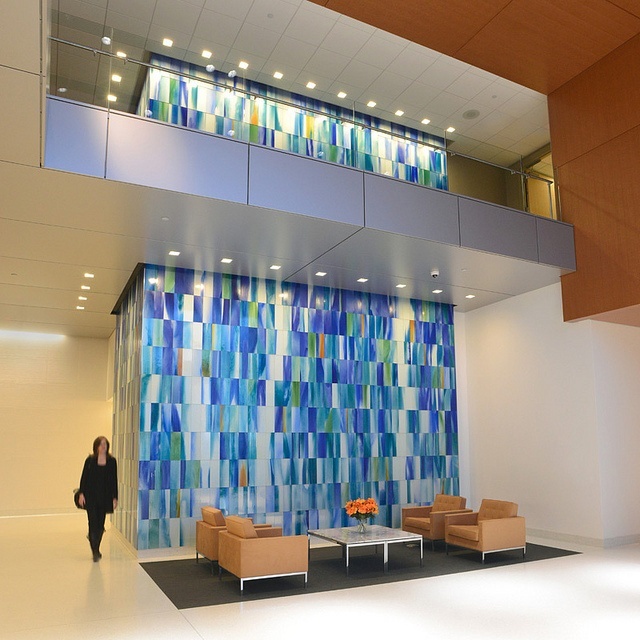 The "Water Walk" is located in the lobby of the new Spaulding Rehabilitation Hospital. The architect, Perkins + Will was "inspired by water, its movement, the play of reflections on its surface and the connections between water and healing." Bringing greenery indoors, Massachusetts General Hospital, Lunder Building has hanging plants cascading from the ceiling. "Certain plants give off antiviral, immune-boosting chemicals called phytoncides that promote health." Salem Health developed a site plan and building that preserved a park-like setting. The rehabilitation center was designed around the concept of a "sculpture in a park." The center radiates around a large courtyard with a beautiful maple tree at its center. You van view more of the design project on Scott|Edwards Architecture. 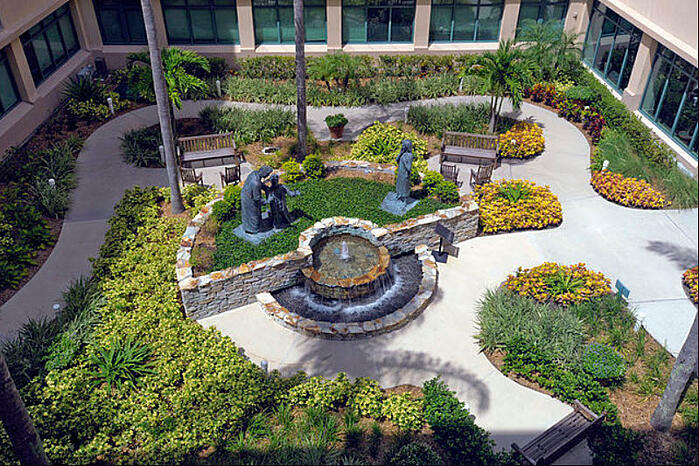 Patients, visitors and staff alike, appreciate green space and gardens. Dr. Roger Ulrich, Ph.D., an evidence-based healthcare design researcher, believes having access to nature can provide relief to those experiencing stress in medical facilities. "There is a pattern of evidence that suggests that well-designed gardens can reduce stress, lower blood pressure and relax people. Also, there is research that shows experiencing nature and looking at gardens reduces pain. Nature seems to reduce pain by blocking stress and reducing the extent to which patients focus on themselves and their discomfort." The importance of visual healing continues to grow in the healthcare landscape. 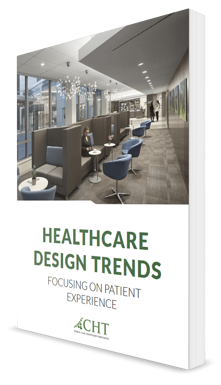 Healthcare facilities today are realizing that design techniques play an influential role in the overall patient experience and healing process. Every hospital or facility shares a common purpose: to improve sustainability and safety in healthcare facilities and develop patient satisfaction.